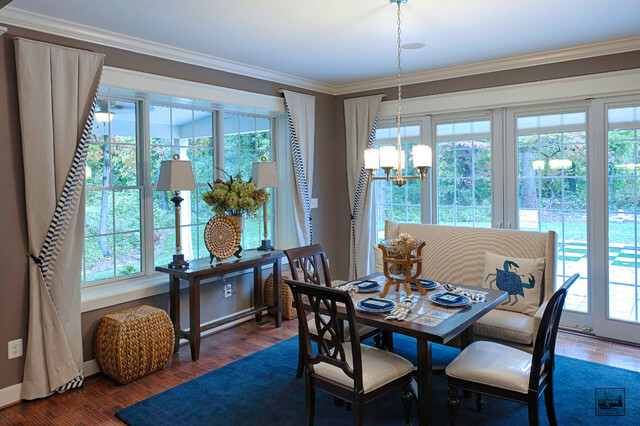 Dining Area in the Kitchen of the Maryland Green Designer Show House is very comfy with the dining Settee at the Blue and white Tiled Table. Designed by Gina Fitzsimmons ASID. I love the lamps - where can I buy them? Thanks! Paint color - What is the color of the walls? What is the width of the curtain panels on the window. 18" or 24"?? Interesting- never thought of it like that. Thanks so much! curtains and hold back - Are the curtains the same fabric front and back? How wide are inverted pleats? Is the banding 6" in width? What did you use for curtain tiebacks? Finally how did you mount to wall....plywood with L brackets? A very simple yet impact style curtain! Really ties everything together without being too fancy. So tastefully done! Thank you! love the adorable pillow - a little bit whimsical!